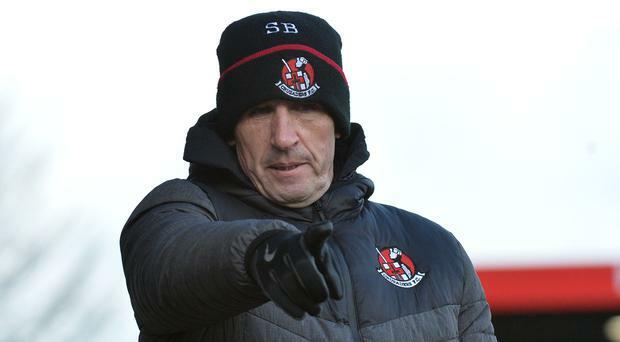 Crusaders manager Stephen Baxter wants his players to finish the season in style by winning every game. The Crues visit Warrenpoint Town tonight knowing their title defence is virtually over but Baxter wants to keep spirits high going into the big Tennent's Irish Cup semi-final against Coleraine on March 30. The County Antrim Shield winners saw off Cliftonville 2-0 in a north Belfast derby at Seaview on Saturday and the Crues boss is expected to make changes again tonight to lessen the impact of injuries and suspensions. Town also have an Irish Cup semi to look forward to and manager Stephen McDonnell could also shuffle his pack, knowing their Danske Bank Premiership status looks assured. But even though their title dream is over, Baxter will demand his players stay on the front foot. "Win every game, that's my simple message," said the Seaview chief. "Don't go into a game thinking we'll play a game of football and get through it. "That's not my way, even in pre-season friendlies. Players now have to be hungry and have to want to have a shirt for the semi-final or final if the club makes it. "Performances are on the line and I told them everything is monitored in training and in matches. They know the competition for places and the standards we expect. You can't drop the ball in terms of preparations for these games. "I'll not be dropping my standard and I don't expect the players to." Baxter admits he'll have to use his squad wisely with the big Cup clash on the horizon. "We are losing players through suspension and injury and it's been a busy schedule for us," he admitted. "The squad is being tested and we'll have to assess injuries. It's opportunities for others to step up and be counted. "Warrenpoint don't have a big squad either and they deal with the same problems, so you cannot use any excuses." All of Crusaders' five post-split fixtures are on the road, a scenario which may have been more frustrating had the club been involved in a tight title race. "I knew it would pan out this way and that's the way the fixtures have fallen," added Baxter. "We accept that and last year we had a few at home. I'd like to have one at home but you accept it and get on with it. I've no complaints." Despite the win over Cliftonville, the Crues boss said there was plenty to work on. "I felt Ronan Hale could have attacked more," he said. "He had opportunities to burn Levi Ives, go on and score, but he didn't do it so we'll work on that. "But from a tactical point of view we were pleased with the three points, two goals and clean sheet." There was a nasty clash of heads involving Garry Breen and Ross Clarke but both players weren't seriously hurt. Clarke, however, is unlikely to feature tonight. Baxter added: "The doctor checked out Ross and he's fully coherent. "I'm sure he'll have a sore head for a day or two."